In the sociology of religion, there are no strict boundaries between churches, sects and cults. Instead, religious organisations are positioned on a scale, with the amount of tension between the group and its surrounding society as the determining factor. A few key concepts of this approach are explained in this article. Deviance is departure from the norms of a culture in such a way as to incur the imposition of extraordinary costs from those who maintain the culture. Mormonism started as a restorationist Christian sect movement, focused primarily on the organisational issue of finding “the true church”. The traditional Christian churches were rejected, but their beliefs and practices were initially maintained. Pretty soon, however, Joseph Smith began introducing many novel beliefs and practices. These were not novel in themselves but to traditional Christianity, causing Mormonism to transform from a sect to a cult movement. But deviance, as used in the definition above, is not strictly a theological phenomenon. Belonging to a deviant religion such as Mormonism also comes at a social cost – social acceptance, friendships and participation. This was most pronounced in the 19th century, when Mormonism was in a constant state of conflict with its neighbours, culminating in the complete (though short-lived) withdrawal from American society in the isolated territory of Utah. Today, Mormonism is no longer geographically isolated but still deviant from the societies it operates in. In most parts of the world, for instance, Mormons cannot participate in basic social exchanges such as having a cup of tea with a neighbour, sharing a drink after work, or spending time with friends over the weekend, without constantly having to establish, or even defend their deviance from socially accepted behaviour. As will be shown below, this lack of participation is measurable. Tension is a psychological concept signifying a state of unhappiness resulting from strong, unmet desires. Millennialism, the idea that God will intervene in a corrupt society and make everything right, is one expression of this. Deprivation is having less than others (in terms of possessions, but also power, influence, freedom, status, etc.). Strain is caused by contradictions between the individual and his sociocultural environment. These occur when a person or group has ideas about how things “ought to be” which deviate from the societal values. People who perceive such contradictions as flaws of society are attracted to cult movements which reinforce their beliefs and prescribe a specific set of rules to live accordingly, regardless of society’s cultural norms. It is sometimes argued that in Utah and the Mormon Corridor, the social cost of being a Mormon is relatively low because Mormonism is the dominant religion there, and should be considered a church rather than a sect or a cult in this region. From a sociological perspective, this requires the Mormon Corridor to be a completely closed social network, a society of its own (Stark & Bainbridge 1987, p. 61). 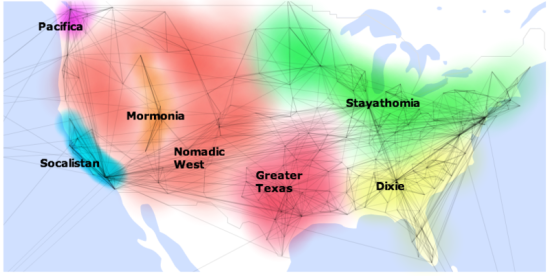 Warden’s analysis showed that the Mormon Corridor, or “Mormonia” as he dubbed it, is noticeably isolated due to the fact that Mormons have almost no social ties or interests outside their own community (at least as far as can be gleaned from Facebook). While Mormonism may be considered a church in this limited geographical area, it remains a highly deviant cult movement in relation to the rest of American culture, and indeed the rest of the world.